1967 Dodge Power Wagon – complete – missing seat. SOLD Originally owned by L.E. Myers Company – it is a highly optioned model. Options include: Armrests, padded dash, special mount on grill for engine shut off. etc. 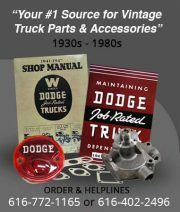 Original Dodge Cab Up For Auction! An original cab stored at DCM Classics is up for auction right now!